This is one of two radar speed displays Benton County installed on Spring Hill Drive in the fall of 2016. Should Albany install radar-operated signs that tell drivers how fast they are going, especially if they’re breaking the speed limit? The city council plans to consider the question Monday. 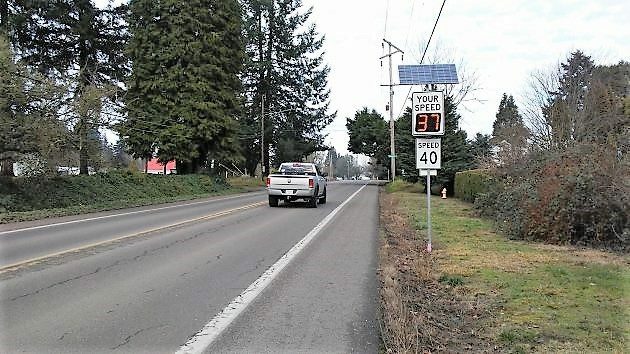 In response to city and neighborhood complaints about speeding through a 40-mph section, Benton County set up two such displays on Spring Hill Drive in North Albany in 2016. Since then city staff members have been examining the pros and cons of doing the same on city streets where speeding is thought to be a problem. The staff memo on this lists various downsides. Among them, the cost of installation and maintenance, vandalism, theft of solar panels if the signs are so equipped, and the possibility that drivers get so used to the displays that the signs lose their effectiveness in slowing traffic down. One option studied: Temporary radar speed signs. But these would require concrete bases just like permanent ones, so would be just as costly to put up. Officials also worry that once a few signs go up, every neighborhood will want some. The staff report with more details is part of the agenda for the council work session that starts at 4 p.m. Monday at City Hall. You can read it here. Most of the people who ignore the laws choose not to read the signs or lights. Only law abiding people will read them. We have come to accept 3-4 cars through a light after it turns red. We have come to accept speeding on the streets and highways. What we need is a type of deterrent. Follow the money….Everyone hates traffic control radar photos. We don’t have the personnel to patrol for traffic infractions. Don’t waste our money on these things….Sub-contract it out….I see it in other cities…Let the howling begin….I hate them too…Better ideas?? The most stupid thing on Springhill is the 20 mph limit by the school from 7 to 5. Nobody is there at 7 and nobody is there at 5 and we never see anyone crossing the road there. Seems it would make more sense to change this, using common sense. Students arrive later than 7 and leave well before 5, but their have been many incidents during the school day when students have climbed over the fenced back playground and have ran onto Springhill Drive and some of the neighboring streets. It is very necessary to have the speed zone at 20 mph at this particular school. Bob Bush, I have never seen 3-4 cars going through a red light. Never. Too bad this did not go through Albany Traffic Safety Committee. I see a lot of drivers going through intersections after their light has changed to red,because my light is green. “We’ve come to accept 3-4 cars through the light AFTER it turns red” was the statement. There is a huge difference between a car going through a red light and 3-4 cars going through a red light…and hardly accepted. How about a empty patrol car with a mannequin in it? How about the people that drive under the posted speed? I see it a lot on North Albany Road going North. A speed limit is a speed “limit.” You can drive below that speed within reason so that you don’t impede traffic too much. The only realistic deterent is a traffic camera that takes pictures when a violation occurs. It’s probably not economically viable for Albany, but the only thing that works. And these unnamed officials are right. Once everyday folks see that traffic has slowed and their streets are safer, there may be a demand from the Great Unwashed for more of these dedicated signs. And then, who knows what citizens might require next. City officialdom is faced with several budget crises on an annual basis. There is simply not enough money available for Public Safety, what with the recent addition of a new Police a station and Fire Hall. Our City Mothers/Fathers know this whole safety thing will eventually die down and they’ll be able to return to more important things, like rebuilding downtown so that it looks just like it did in 1850. I know you are being facetious about some things, but I wish you would have said that the tax money drained off the top of tax collections for CARA keeps safety, schools, etc. from getting money that they need. It would be great if Hasso Hering ran for office in Albany. He’s spent years observing local government and has plenty of time on his hands. Then he could put an end to all these stupid ideas and implement common-sense government. Then again, if he’s just all talk, he’d be better off continuing as is; you see, bloggers don’t have to worry about making tough decisions and trying to please everyone. 45 is that you? Handles matter. Right, David! Hasso, amen. And also: Most stop signs should really be yield signs. If you decide to run for office, get ahold of me so I can help with the campaign. I have lived in many places over my many years but this city takes the cake! Totally bazaar in the things the city thinks up to do and not do here!! Totally amazed and think they have too much time, power, and our money! Or maybe the all just have a warped sense of humor…I bet hh or just about anybody could do a better job! Absolutely have them. Every town I drove through in California had them. They remind you to pay attention to the speed limit. I have been asking for one on south Columbus near the Mennonite Resort. And why 40 miles an hour all the way to S Albany High School?